Conservative Shabbat Shacharit Service 9:45am* in the sanctuary. 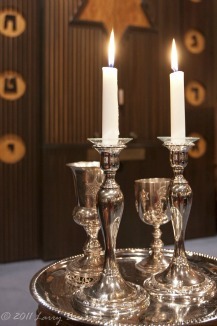 Reform Shabbat Service 10:15am* in the chapel. We suggest business-casual attire such as slacks and shirts, skirts, and dresses. While not required in the Reform services, anyone is welcome to wear a kippah, or yarmulke (head-covering) which can be obtained in our foyer. We ask all those who receive a Torah honor during Conservative services to please wear both a kippah and tallit, (prayer-shawl) when coming up to the bimah, from which the Torah is read. Each month on a Saturday, following Shabbat services, we offer Bible and Bagels, a light lunch and discussion of the weekly Torah Portion. Please check our calendar for the dates of upcoming Bible and Bagels sessions. In addition, speakers, scholars-in-residence, and special occasions will be noted on our calendar. We look forward to seeing you soon!